Casper played two seasons as a tackle in college before moving to tight end and caught 21 passes for 335 yards and four touchdowns. He received consensus first-team All-American honors in 1973 and was chosen by the Raiders in the second round of the ‘74 NFL draft. 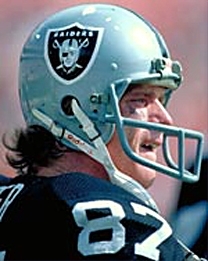 Casper spent his first two seasons backing up TE Bob Moore and caught a total of nine passes for 97 yards, although four were for touchdowns and he also performed well when pressed into action in the AFC Championship game loss to the Steelers in ’75. With Moore gone in 1976, Casper moved into the starting lineup. Raiders went 13-1 to finish first in the AFC West. Won AFC Divisional playoff over New England Patriots (24-21), AFC Championship over Pittsburgh Steelers (24-7) & Super Bowl over Minnesota Vikings (32-14). Casper’s breakout season in 1976 was the first of four straight in which he was a consensus first-team All-NFL selection. Big and fast, he was a formidable blocker as well as outstanding receiver, and made memorable plays in the postseason. Casper was traded to the Houston Oilers during the 1980 season, where he was reunited with former Raiders QB Ken Stabler. His production gradually dropped off and, following a short stint with Minnesota in 1983, he finished up back with the Raiders, now in Los Angeles, in ’84. Overall, Casper caught 378 passes for 5216 yards (13.8 avg.) and 52 touchdowns. Of that, 255 receptions for 3294 yards and 44 TDs came with the Raiders. He added another 27 catches for 363 yards and seven TDs in the playoffs. In addition to receiving first-team All-NFL honors four times, Casper was chosen to five Pro Bowls. He was inducted into the Pro Football Hall of Fame, Class of 2002.